For the past four years, the Open Technology Institute (OTI) and the Allied Media Projects (AMP) have been working with communities to build wireless mesh networks. Mesh is a technology for creating inexpensive local WiFi that allows users to connect their devices directly with each other rather than going through a central hub; unlike a series of wireless hotspots, a local mesh works as a network whether or not it is connected to the Internet. Mesh networks can provide hyper-local tools like neighborhood shout-boxes and local lending libraries, and can keep communities connected even during power or Internet outages. One question we hear all the time from community members, funders, and government representatives is: how do these networks scale? People always seem understandably frustrated with the best answer we can give them: it depends. But it does. It depends on who wants to scale, and why. And it depends on what exactly they want to scale: a particular network, a particular technological solution, the impact of a technology project, or a social process for building a technology. We think of mesh and wireless networks as examples of community technology projects — locally-led and organized initiatives that demystify and open technology up for all kinds of people to use and modify. These projects aren’t just about dropping a technology into a local place; each one involves a combination of tech know-how with local relationships, knowledge, and organizing processes. The technology project is an opportunity for the community to work together to build a healthy digital ecosystem, rather than an end in itself. As we move from starting new networks to nurturing and supporting established ones, we find that scaling up mostly depends on a complex set of dependencies. Who initiates a project, how much it costs, and how it’s governed all depend on the local community, their relationships, assets, and choices. While a “community technology” approach does not create standardized results, it can help keep projects responsive and sustainable as they grow, replicate, or adapt themselves to new places. Each year Detroit’s Allied Media Projects (AMP) organizes the Allied Media Conference (AMC), which brings together a diverse intergenerational network of artists, activists, educators, media policy advocates, organizers, and entrepreneurs who look critically at technology’s role in the development of individuals and communities. The concept of “community technology” emerged at the AMC from from all ways participants demystify technology there — not only learning how to use it, but how to design, build, and innovate with it. People share knowledge on how to build computers from recycled parts, create Internet connections from scratch, and simplify web tools so that those new to technology can participate online. People share their resources and technology to support each other’s growth, ensuring that histories, cultures, and stories from the margins will not get erased in the digital age. By making technology more accessible, we have created the space to ask critical questions about the role of media and technology in restoring community and creating new economies rooted in local relationships of accountability, mutual aid, trust, and authentic communication. How can people create content for the Internet and simultaneously build community in their neighborhoods? How can we move past the goal of an “information superhighway” and create the online equivalent of sidewalks and bike lanes for communities that may have been harmed by media and technology? In the four years of investigating these questions deeply at the AMC and through media trainings, experimenting with wireless mesh technologies, and seeding public computer centers, it has become apparent that the community technology approach is an essential component to building a healthy digital ecosystem in any city, not just Detroit. Because of the rapid development of technology and its integration within social services, a digital hierarchy has emerged where essential resources can not be accessed if you are less digitally literate or unable to enter online spaces. This uneven distribution of resources leaves people in dire situations, resulting in class tensions which can lead to crime, violence, and neighborhood destruction. These issues cut deeper than the surface issue of broadband access — they shape people’s identity, environment, and future. We’ve learned from building community-owned communications infrastructure in different localities that the restoration of neighborhoods can not be solely addressed by offering public Wi-Fi or putting computers in people’s homes. In other words, placing a system in people’s lives without offering the skills to customize, adapt, and maintain that system is not enough. It takes a combination of resources, and both collective and individual commitments to healing from cultural trauma, to restore relationships that can sustain the wealth of knowledge in our neighborhoods. Technology and the Internet have the ability to transform our communities, assist in economic development, and reveal the power and potential that already exists within local places — but only if technology projects are led by the people who are the most invested in the welfare and future of those communities, and who best understand local needs, relationships, and culture. “Mesh networking” itself simply describes a kind of routing protocol for building decentralized networks. Some use mesh protocols to route data to and from surveillance cameras and first responders (or potentially even to track MAC addresses of all the devices moving around a city). However, our local partners use their community mesh networks for resilience planning, disaster recovery, broadband access in underserved neighborhoods, open government initiatives, and community-level media sharing. As a DC-based think tank with a wide reach and a mandate to initiate and study community technology, OTI works to explain, document, and systematize the process of building networks to the point where people with relatively little technical expertise can organize and plan projects. OTI and AMP started building a community mesh network in 2011 in the Cass Corridor neighborhood of Detroit using a beta version of OTI’s Commotion mesh firmware. At first, OTI worked with a few volunteers to install and test nodes. We then started approaching local community “anchors” — for example, a well-known independently owned hardware store and a church that hosts several community organizations — to join the network by allowing us to install nodes on their rooftops. However, the network did not grow without our direct intervention, nor did it attract users. 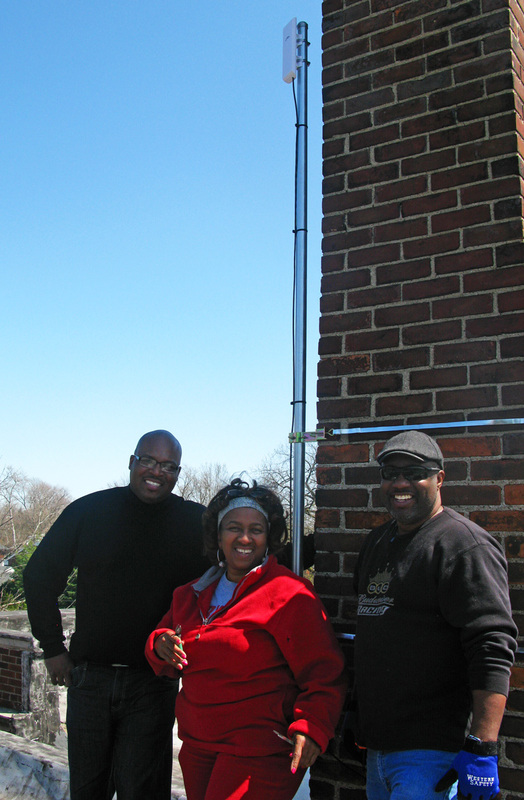 Digital Stewards Monique Tate and Ulysses Jones and Pastor DaRell Reed with a router they have just installed on the Spirit of Love Church in Detroit’s Morningside neighborhood. We soon realized that the network would not become a neighborhood resource without the stewardship of diverse local people. OTI would not be able to plan, install, maintain, and publicize the network without considerable investment from AMP and other local groups; nor would the network match the needs of the local community unless they were involved in planning, installing, and maintaining it. So we shifted our focus to building a set of training tools guided by the Detroit Digital Justice Coalition’s Principles (Access; Participation; Common Ownership; and Healthy Communities) to demystify the technology and invite residents of Detroit to use it to build and adapt networks to their own digital ecosystems. From 2012-2014, AMP and OTI built and refined the “Digital Stewards” curriculum as part of AMP’s Detroit Future Media program. AMP has now graduated three classes of Stewards, and the program and its curriculum, the Commotion Construction Kit, has spread to Red Hook, Brooklyn and Sayada, Tunisia. In Detroit, there are now seven mesh networks in various stages run by Digital Stewards in different parts of the city. Each of these networks is small-scale, rooted in local needs and culture. These networks and their organizers can join efforts to collectively share knowledge, advocate, and plan — but each functions separately as a rooted part of its local ecosystem. We have found that working in community technology always requires thinking about scale: what is the functional unit of a technology? What’s the right size for a project — and should we measure it in nodes, transmitters, people, square miles, or neighborhoods? Is scale limited by the technology itself, by the cost, by the regulatory context? Or do social factors determine the scale of technological intervention? It’s hard to determine the “right size” for community networks, partly because they are theoretically infinitely scalable, in addition to being inexpensive, resilient, lightweight, and adaptable. The largest community networks in the world — GuifiNet in Catalonia, FunkFeuer in Austria, Freifunk in Germany, AWMN in Greece — have all expanded beyond the cities where they started and are now covering large swaths of their respective countries. Yet at any scale, these networks require a variety of skill sets for implementation (people skills, tech skills, hardware skills) — and the expertise required increases proportionately to the size of the network. We find that the question of scale is less about the capacity or regulation of the technology itself and more about the social process of collective action and coordination. In fact, the characteristics of mesh technology that make it a potentially successful community technology at the size of a neighborhood can cause it to fail at the size of a city or region. With a small local networking project, what generally motivates people to engage is the goal of visible, direct impact on their neighborhoods. They can share Internet connections or local apps and services with their neighbors, figure out ground rules for management and financing, and perform maintenance when needed. Self-governance and process are as important (if not more so) than technical functionality. When projects get bigger — or if they start out with an ambition to be large-scale — questions of governance and responsibility are different. When people expect something to function as a service they pay for or that is provided by the government as a basic utility or public good, free-ridership and expectation management become challenges. And if a city or a company wants to build, govern, and maintain a large-scale wireless network, a decentralized system like mesh may not be the right technology at all. They are sustainable, since participants see value and impact in their everyday lives. So why even bother with the question of scale? In our experience, there are many benefits to an organic, locally self-sufficient process of scaling, when conditions are right. It can help create relationships that enable people to share skills, information, and resources about community technology and beyond. Healthy scaling can also be an agent of change, bringing together people with shared interests and creating a body of evidence around alternative models for technology ownership, governance, and dissemination. It’s rapidly becoming accepted wisdom in many funder and government circles that giving money to shiny technology projects can backfire when the technologies don’t work, when people are not interested in using them, when equipment or software to maintain them is not available, or any number of other common problems crops up. On the other hand, without scaling existing community technology projects rooted in their local contexts, it is hard to show evidence that community-led technologies like mesh are viable and have clear benefits. Community technology can be a powerful force for change and has even been shown to be essential for resilience. For example, when Sandy hit Red Hook, Brooklyn, the network was a lifeline. As a local community resource run by a trusted neighborhood institution familiar with local needs, Red Hook WiFi was able to organize response and aid in a way that federal, state, or even city-level agencies could not. We wouldn’t have evidence of this if the work of Detroit community-based organizations had not been shared with organizers in Red Hook. Community technology is a method of teaching and learning with the goal of fostering relationships and healing neighborhoods. Community technologists are people who have the desire to build, design, and facilitate healthy integration by teaching and learning how technology can support both needs and personal and collective visions. By starting small — person-to-person, neighborhood-to-neighborhood — you can ensure that growth is adaptable and intentional, offering a better chance for sustainability. When individuals are invested in growth, a symbiotic relationship occurs between the systems designed and those that use the systems, allowing growth to emerge organically. This type of symbiotic relationship, which is present in healthy ecosystems, is less likely to occur when a system is simply placed into a new environment without consideration of existing knowledge, relationships, and efforts that already exist there. The failure of many well-intentioned technology projects may in the end be a failure to plan for scale in an intentional way. As digital skills, access, and governance become more and more critical to healthy local ecosystems, we may need to learn how to think small to think big — especially when it comes to something as vast and all-encompassing as technology. 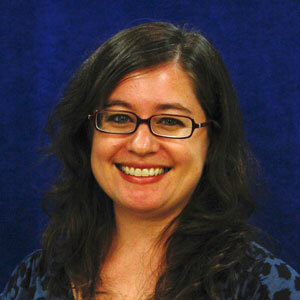 Greta ByrumGreta Byrum is an urban planner and a senior field analyst at the New America Foundation’s Open Technology Institute. Her work focuses on digital access, disaster response, and the community development and resilience potentials of small-scale local infrastructure such as low-power FM radio and wireless Internet. 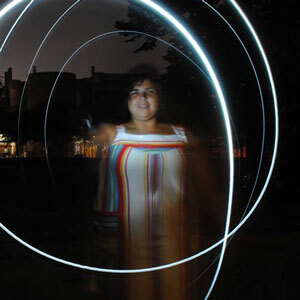 Diana NuceraDiana Nucera has worked in media arts and technology for fourteen years and currently coordinates the Digital Stewards Program, a sponsored project of Allied Media Projects in Detroit. Her work focuses on fostering community rooted media makers and technologists that use media and technology with their communities to investigate, illuminate, and develop visionary solutions to the crises they face.